The first week of August 2017 I jutted up to Cedar Lake, Indiana, just south of Chicago and Gary, for UTR Media's Escape to the Lake music festival and retreat. 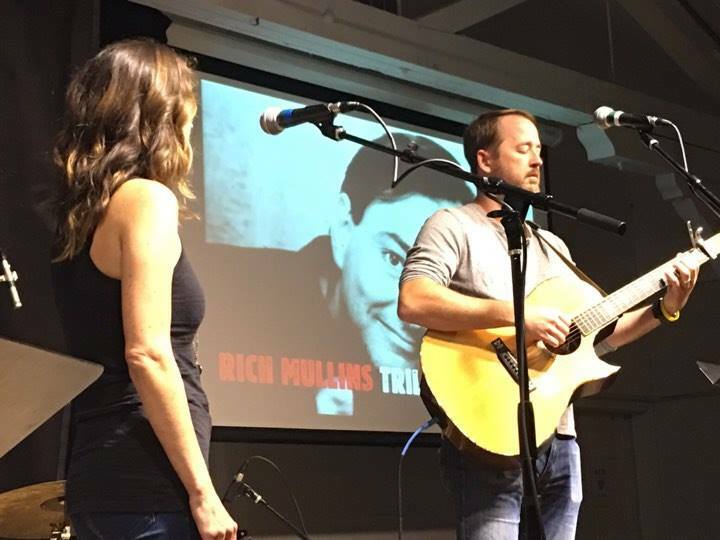 UTR's Dave Trout had invited me up to cover the event, do some interviews, and attend the Rich Mullins Tribute concert on August 4. This is a profile of my time there. 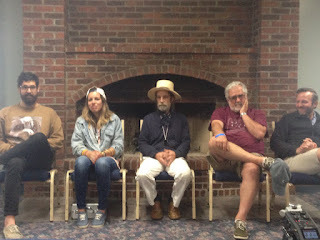 I was sitting on the front porch of one of the dorms at the retreat center, taking in an unplugged rehearsal with Jimmy Abegg, Ben Pearson, The Mosley's, and half of For Brothers (more on that in a minute), when a familiar looking woman sat down and started listening along with us. I was there as a hanger-on, a privileged guest who never would have otherwise been given access to a front row seat for hearing one of Christian music's most revered artists (Abegg) and photographer/cinematographer (Pearson). But I was the journalist. Who was she? "Are you Jill Phillips?" I asked. I had placed her face amid my tangle of memories. "Uh-huh," she smiled, excited as I was to be able to sit down and take in the music being made before us. A veteran artist had sat down, grateful to be a fly on the wall along with me, a guy who just got there. She was as mesmerized as I was. It became apparent Escape to the Lake was a different kind of event. Here, artists and attenders mingled freely, engaging in conversations and exchanging their art with each other. Here, everyone was grateful just to be there. A couple of hours earlier I arrived at Cedar Lake Ministries retreat center and walked around until I found a few people who looked like they were employees and could point me in the right direction. I found Dave Trout (founder of UTR) in a basement seminar room, talking to a few people, looking like he was in transit from one event to the next. To my surprise, sitting right in front of Dave was Jimmy Abegg and Andrew Greer. Abegg is one of my heroes, a true artist, the kind of guy for whom creativity is a default position. Solo albums, countless guitar work as a session musician, painting, and photography: I've followed his career steadily since I knew he was Rich Mullins' and Charlie Peacock's go-to guitarist. And then there was Greer, who was releasing a book on Mullins the next month, had a great video series with CCM Magazine, and was a fine artist in his own right. I had no idea what I had just walked into, but right in front of me were two people I could spend some considerable time talking with. I introduced myself to Dave Trout, and upon hearing my name, Jimmy stood up and exclaimed "Oh man, is that Chris Marchand! It's so nice to meet you!" 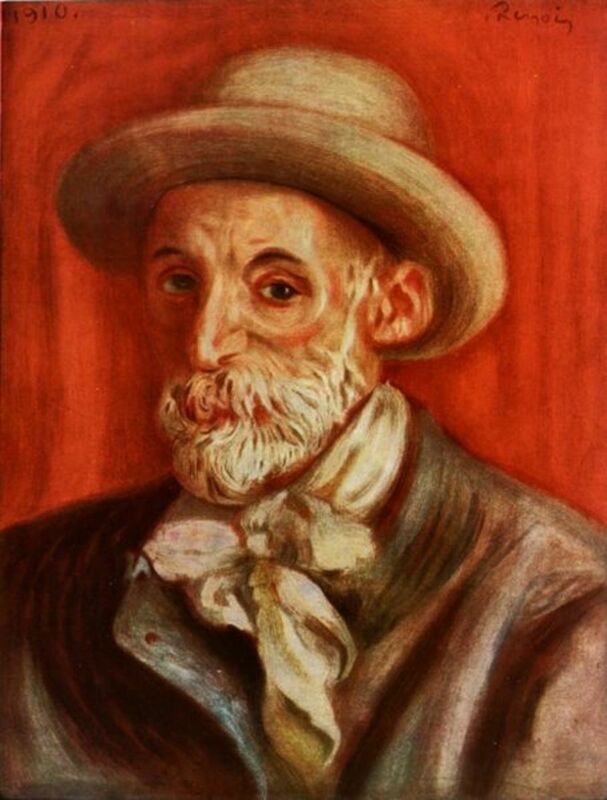 He came over, gave me a hug, and I found out the rumors are true: he smells of fine cigarette smoke and dresses like Auguste Renoir. The only reason a guy like Jimmy would know the name of a guy like me was that I had interviewed him a couple of months ago for the Rich Mullins podcast I started with Joe Cook. He was grateful for a couple of conversations we had about his Be God's project that hadn't quite been able to make it past the funding stage. Afterward Greer let me follow him around while he got ready to do a sound check for the Mullins Tribute later that night. We walked the grounds while Escape to the Lake campers sang at a robust "Root Beer Hymn Sing" and played 9 Square in the Air. Greer and I discussed the state of the "Christian" music industry and I lamented the position independent artists find themselves in, having to do all the work themselves, inevitably having their music forgotten in a generation. He didn't seem to think artists like himself were worth feeling sorry for. They were doing what they loved, and being able to bless people with their music in the present was enough. Later I found out Greer is a consummate piano player, with a crisp soulful Gospel voice. I don't know that "Gospel" or "Southern Gospel" has evolved much in the last few decades, but Greer seems like the kind of artist who push the genre into the future. I have to admit: I approached attending this event with a bit of trepidation. There were so many artists present, all of them with volumes of music worthy of my attention, and I had listened to hardly any of it. To me it's a problem paralleled by the current state of television: with all the streaming services, cable, and network shows available to us there is simply too much to watch. We will never be able to get to it all. But the music of independent artists feel like a much more personal endeavor, and so guilt seeped from my pores and eardrums as I walked around the merch table, countless albums crying out to be listened to, crying out for a chance. But this is why UTR Media and Escape to the Lake exists. As I have documented before, "good" "Christian" media needs a voice, a channel, a megaphone in order to get heard and in the public's field of vision. Christian music gets harped on for being trite and derivative, but there have always been great artists making bold art, even from within the ghetto. With UTR Dave Trout has the boldness to believe this music is worth hearing. I envision Trout as a musical curator, or to use his own term, a chef cooking up gourmet music for us all to partake of. UTR has some big plans for the future as far as how they can help change the game in Christian music, but for now a good place for anyone to start is their most recent sampler of artists, which you can download for free. At another point Jimmy played through one of my favorite songs of his, "The Dream." I was too gobsmacked to record it. It was beautiful and there were tears in my eyes. You can see my shaky recording of that song during Jimmy's proper set below. From there I hung out with The Mosley's (Stephen and Rachel) as they grabbed some supper. They shared with me the crazy story of how they came to record their first EP, how people started paying attention to them, and how Jimmy and Phil Madeira recorded their first proper album with them. We made plans to do an interview later than night. The evening concert kicked off with an artist I regretfully cannot remember, the curse of conducting multiple thoughts at the same time. Instead, at this time I managed an impromptu conversation with Ben Pearson, where I got to ask him about filming Rich Mullins' music videos and making films with Steve Taylor. Jimmy's set was a bit rocky (due to lyric recall problems) but it was still heartfelt and special. Along with his more memorable songs such as "The Dream" and "Small Touch of Love" the performance was notable for the new songs he sang, one for his granddaughter and one about aliens. Let's hope he is able to build Blind Jimmy's LIghthouse studio and get to recording another solo album soon. In the midst of this business Dave Trout and I jutted out for a brief interview that to my great chagrin did not get recorded due to me pushing the "record" button one more time than was necessary. I hope to re-interview Dave some time in the near future. We then made our way back for the start of the tribute concert. Alright, enough hemming and hawing and soapboxing. 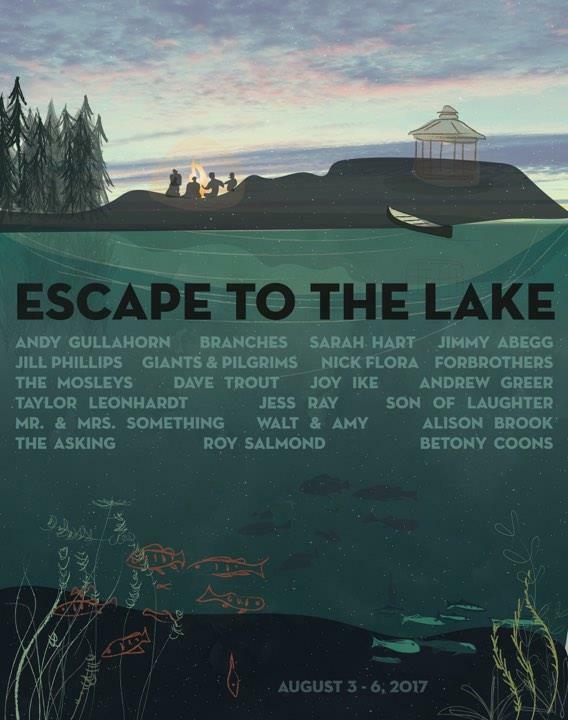 The Escape to the Lake Rich Mullins Tribute Concert won me over. It was a wonderful evening filled with stellar tributes to Mullins and a number of video clips containing his most iconic and prophetic teachings, reflections, and off-the-cuff interview remarks. Really, it was Andy Gullahorn's opener of "Peace" that immediately grabbed me. Somehow he managed to transfer the decidedly piano-based song onto a countrified solo acoustic guitar arrangement. It was sparse and transfixingly stark. Other highlights from the night include Son of Laughter's Nick Drake-esque version of "The Color Green", Abegg's duet of "You Did Not Have a Home" with Mr. and Mrs. Something, and Greer's leading us all in Mullins' worship songs at the end of the night. In the middle of it all Abegg and Pearson recounted their memories of Mullins and we got to hear some little-heard stories, especially from Pearson. What I relished most about everyone's versions of Mullins' songs is how they reimagined them in their own artistic voice and yet retained the spirit of the original. All in all they managed to soften this Tribute Album/Concert Grinch's heart. It was an evening where I smiled and laughed out loud at Mullins words, sat in silent reflection at the beauty and meaning presented to me, and sang my heart out when I felt like it. By the end of the concert it was getting late, but I needed to stay a little longer. More conversations needed to be had. While Nick Flora hosted a dance party elsewhere I sat around jabbering on the sacred porch with Stephen Mosley, Andy Gullahorn, and the lead singer of Branches before interviewing the Mosleys. After the interview a number of us had a makeshift gawking session about Carman, his $200K Gofund Me campaign, having numerous cancer scares, and his atrocious new song "President Trump Blues." The greatest joy was in watching Nick Flora (who had now joined us) become increasingly incensed at the audacity and bad taste of Carman's late stage career. I didn't want to, but I pulled myself away around 1 a.m., and drove home wondering where an event like this can go into the future. Here's my takeaway on Escape to the Lake: I wish I could have stayed for the whole thing. I wish I could have went to every seminar and panel discussion. I wished I could have eves-dropped on every conversation about music, God, books, and how to make great art. I wish I would have scooped up every artists' albums so I can listen to them and get inside their musical world. I want to be both a full-on fan and artistic contributor. 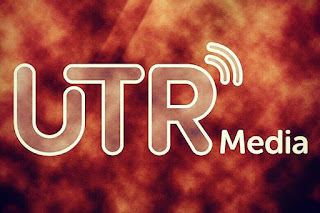 UTR provides a unique environment for Christian-based music that tragically would never make it past the gate holders of Christian radio as well as a forum where fans and budding artists are offered proximity to seasoned music veterans. 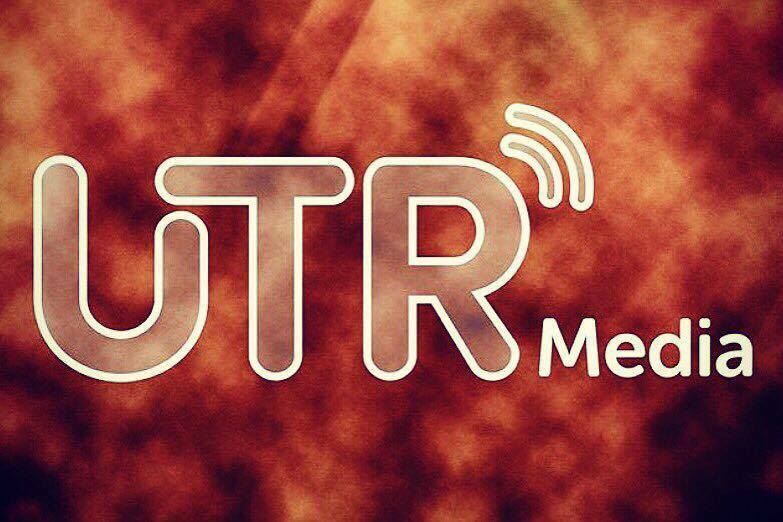 The festival has been going on for a few years now, and UTR Media is stepping into a new era, but I can only hope both can grow in the coming years, becoming even more of an outlet for great music. *Although I need to admit that for years I have wanted to record my own Rich Mullins covers album. My album, however, would be completely worthwhile, because all my ideas are BRILLIANT. Why I Cringe Everytime Someone Says "I Hate Christian Music"